UPDATE: A copy of Sessions’ speech has been leaked and there’s a reason why he wanted it hidden. 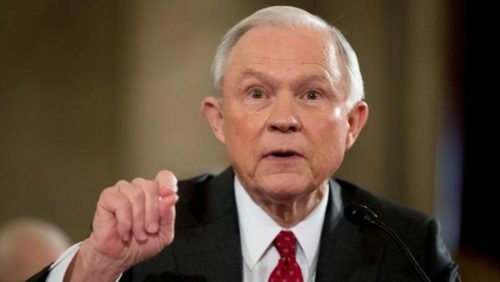 The Department of Justice is refusing to release the transcript of Attorney General Jeff Sessions’ speech to an anti-LGBTQ group Alliance Defending Freedom, delivered on Tuesday at its Summit on Religious Liberty. The event was closed to the press, and attempts to get a copy of the remarks delivered by Sessions from the DOJ have been denied. “The Department of Justice released a transcript of remarks he delivered in Dallas earlier on Tuesday and a transcript of remarks he delivered in Las Vegas on Wednesday, but a transcript of his address to the Alliance Defending Freedom has yet to be released,” ABC notes. Alliance Defending Freedom is also refusing requests for a transcript of the speech. Alliance Defending Freedom is supporting Jack Phillips of Masterpiece Cakeshop, the Colorado bakery at the center of a case the United States Supreme Court has decided to take up to determine if religious people have a license to discriminate against LGBTQ people. It has been labeled a hate group by the Southern Poverty Law Center for its anti-LGBTQ stances, and now the group has filed a Freedom of Information Act request to obtain the transcript of Sessions’ remarks. “We’re concerned that Attorney General Jeff Sessions would make a speech behind closed doors to a group that supports criminalizing homosexuality and marginalizing LGBT people around the world,” David Dinielli, the SPLC’s deputy legal director, said in a statement.